Vancouver had 27 consecutive days of rain. This couldn’t break the longest record of 28 days in 1953. I bet people at a meteorological observatory were disappointed. 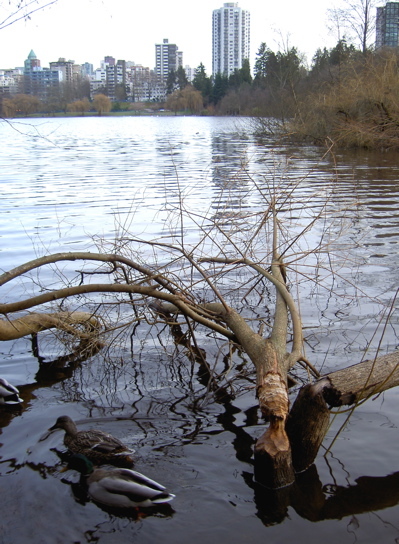 On sunny Sunday we went for a walk around Lost Lagoon in Stanley park. These trees were bent down. We found beaver tooth mark at the bottom of the trees. Did beavers give up taking these trees? or are they coming back? I love to see beavers since I have never seen them before. It started to rain again the next day (ToT).